It’s an idiom that seafood packagers around the world can get behind – and even in front of – with innovations in the sector transporting product presentations to new dimensions and heights. 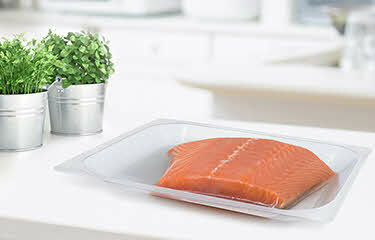 Vacuum skin packaging (VSP) and modified atmosphere packaging (MAP) have not only improved the shelf life of perishable proteins like seafood, but brought these products out of hiding. Today’s consumers are able to reach out and actually feel some of the fillets or lox they’re contemplating buying at the chilled seafood case, thanks to these developments. In the frozen aisle, shoppers are being greeted with more seafood products that come complete with all the fixings and hardware to season and cook their dinner, courtesy of emerging tray and film techniques. The allure and aroma of a home-cooked meal is now available without the typical hassles of clean-up and prep-work. This combination of convenience and sensory appeal has proven to be a powerful elixir for the modern consumer, and food packagers are taking notice, according to consumer food packaging veteran Charlie Ahern. “Consumers want something that they can buy that looks and feels like it’s homemade, that smells good, that looks good. [They] want the rewards of cooking without the intense time-consuming labor and mess involved,” said Ahern, who currently serves as the general manager for Advanta Packaging Inc., a global packaging solutions company. “We are seeing more fresh fish vacuum skin packed (VSP), in the past two years, on fiber-based boards with graphics, to thin plastic sheets,” noted Dave Favret, product manager for Harpak-ULMA’s TFS series, and Blair Vance, product manager for the firm’s Mondini line. “With VSP, we can almost see the entire fish or the beautiful fillets layered out on the sheets. Smoked salmon can now be presented on a hanger in the store with detailed billboard graphics. Today, consumers can scan QR codes to immediately view recipes for that evening’s preparation,” Favret said. At this year’s Seafood Expo North America event, Harpak-ULMA will feature its new TFS 200 MSV (MAP, Skin, Vacuum) machine, “an entry level model that demonstrates versatility and has the capability to produce MAP and VSP packages,” the Harpak-ULMA representatives said. VSP’s persistent relevance in the seafood packaging sector hardly comes as a surprise for Scott Corey, the director of marketing for Charlotte, North Carolina-based plastic packaging developer Sealed Air.